World Clock – Time Zones is a free world clock that displays time of all the cities across the globe. The app is free for downloading and using it on your Windows 8 and 8.1 desktop. The world clock app is developed and brought by the timeanddate and is its official app. This world clock app opens with default clocks showing time of Beijing, London, New York, Paris and Tokyo. You can delete the default cities by right clicking on each of them and selecting Delete Selected from the menu dock at the bottom of the screen of the world clock app. To add new cities to see their time, you can search the city using the search bar on the top of the app’s screen and click on the displayed city. It will be then added to the list on the right side of the cities to show the time. In addition to the clock, this app has features like that of meeting, calendar, event, countdown, city info, weather, moon, dial codes, full screen, live tile, etc. Some of the features of this world clock app are disabled or locked but can be accessed if purchased. Most of the tabs of different features open in the default browser as they are connected and displayed on the website of timeanddate. The clock of the city is displayed in digital manner with background of the cityscape, below the time you can see the day and date as well. On the right side, you can see the time zone, sun rise and sunset timing, start and end daylight saving time. 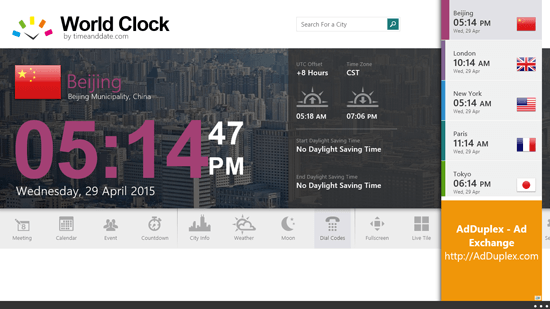 You can add many cities to the list of cities to display the time of them. The app also synchronizes every time you open it to show you the correct time. The app shows advertisement on the bottom right side of the app as this is a free version of the World Clock app. 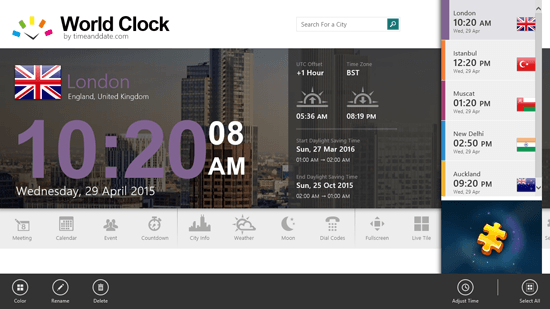 Get World Clock – Time Zones.